Wisconsin Emissions Tests can now be done at Wilmot Auto Service. The test is free to you. Call 862-6300 for an appointment. Hours are Monday through Friday 7:30 a.m. to 5 p.m. and Saturday 7:30 to 11 a.m.
Wilmot Auto Service, Inc is an independent auto repair shop and has earned the Blue Seal of Excellence Recognition as prescribed by the National Institute for Automotive Service Excellence, (ASE), a non-profit organization dedicated to improving the quality of vehicle repair and service by means of voluntary testing and certification for automotive repair and service professionals. Dwayne & Cindy Garwood are the owners and Dwayne is an ASE Master technician and has been in the automotive repair business for over 25 years, 15 of these years have been in Wilmot. 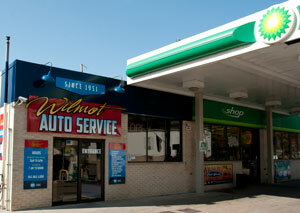 Dwayne’s grandpa Harmon Garwood started Wilmot Auto Service in 1951. They are celebrating 63 years in business. He employs ASE certified and ASE master technicians. Dwayne’s commitment to you has always been to offer the highest quality, honest and friendly auto service.